Did you ever wonder what it would be like to be fit like a Tour player? Now you can at SeeMore World Headquarters in Franklin, TN. 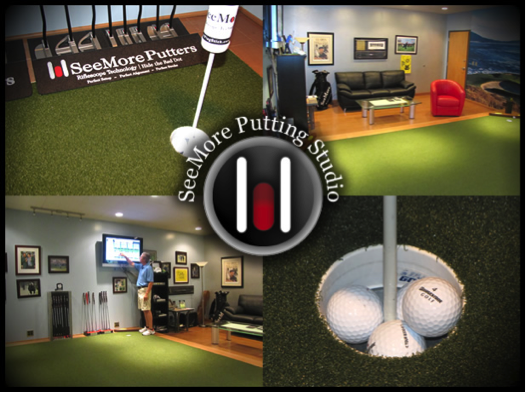 The SeeMore Studio was originally created as a place where the best players in the world could come and learn to perfect their putting by utilizing the SeeMore Putting System. Our SeeMore Tour Fitting Experience is a one hour long session which features world class fitting from a member of the SeeMore Putting Institute (SPi) staff instructors and an introduction on how you can use your putter to become more solid with your fundamentals and make more repeatable, consistent strokes. During this process, we will explore different head designs and how this can influence stroke mechanics with the help of SAM Putt Lab. This will also include identifying the perfect length, lie and loft. Once completed you will have the specifications of the putter that best fits you and will allow you to build solid mechanics for years to come. This is the exact same process we use when working with LPGA or PGA Tour players. Your visit will truly be one of a kind. Not only will you be treated to an unbelievable putting experience but also with time permitting you will have the opportunity to tour our world headquarters and see firsthand SeeMore’s unique custom building process. We want to be a part of your journey to become the best putter you can be for years to come.